Common signs include oil leaking from the oil cooler adapter, engine block, and oil filter. 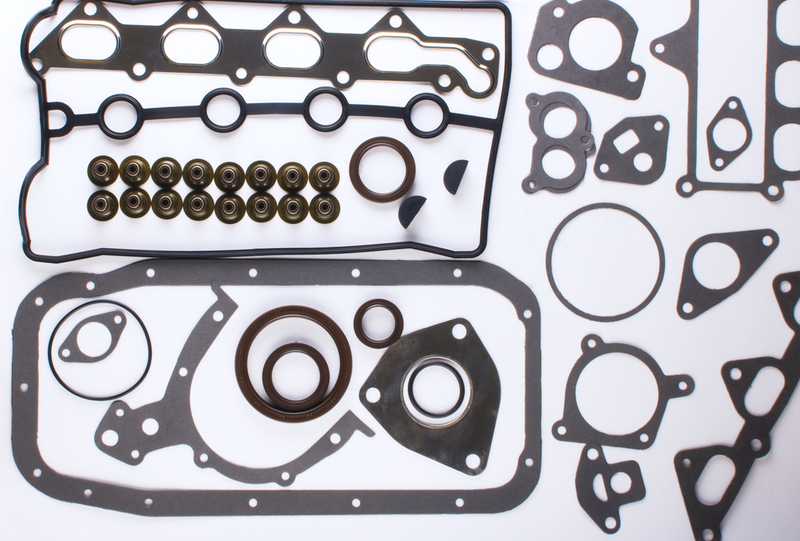 Prevent damage to your engine by getting the gasket fixed. In most cases, a vehicle owner will never experience a problem with the oil cooler underneath the hood of their car, truck, or SUV. However, when a problem does pop up, it's usually due to a failure with the oil cooler adapter gasket. This gasket is commonly made out of rubber and is similar in design and function to an o-ring, where pressure is applied from the adapter to the male fitting which allows the gasket to compress, forming a protective seal. When this gasket fails, is pinched, or wears out, it can cause oil to leak from the oil cooler, which can impact overall engine performance. The engine oil coolers used on most of today's modern vehicles are essentially water-to-oil heat exchangers. Oil coolers use the engine cooling system to remove excess heat from the engine oil. The coolers are supplied with engine oil from an adapter that sits between the engine block and the oil filter. Oil from the engine is circulated into the oil cooler, where coolant from the vehicle's radiator system circulates, creating a condition similar to most air conditioning units in our homes. Instead of cooling the oil, heat is removed. The oil cooler adapter has two gaskets that connects the oil lines to the oil cooler and returns oil back to the motor. One gasket seals the oil cooler adapter to the engine block. The other gasket seals the oil filter to the adapter. Occasionally, if the gasket wears out over time on either end of the oil cooling lines, it will cause oil to leak. However, there are a few symptoms that could also indicate a problem exists with this component. Noted below are a few of these warning signs that should alert a driver to contact a certified mechanic as soon as possible, so they can replace the oil cooler adapter gaskets. As noted above, there are two specific connections that utilize an oil cooler adapter gasket: lines connected to the oil cooler and those connected to the engine block or oil filter. When oil is leaking from the oil cooler attachment, it's usually caused by a pinched or worn out gasket that is designed to provide a tight seal around the male fitting of the cooler and the female ending of the oil cooler adapter. A small leak will be noticed by oil dripping onto your driveway or under your car, usually located near the rear of your engine. However, if gone unrepaired, it can create excess pressure to build up within the oil lines and cause the gasket and adapter to completely blow. If the gasket completely blows out, you could lose the entire contents of the engine oil pan in a matter of seconds. Anytime you notice an oil drip, make sure to contact a local ASE certified mechanic so they can inspect it, determine the location and cause of the oil leak, and make appropriate repairs to ensure your engine maintains lubricity. We stated above that there are two areas that connect oil lines running to and from the oil cooler. The second is either the engine block or the oil filter. On some cars, trucks, and SUVs sold in the United States, the oil cooler receives its oil from the oil filter, while on other vehicles it comes directly from the engine block. In either case, both lines have oil cooler adapter gaskets that keep the two connections strong and secure. When the gasket fails, due to wear and tear or simply old age, it will cause the connection to be loose and lead to excess oil leakage. If you or an oil change technician tells you that oil is leaking from your oil filter, it is likely caused by a bad oil cooler adapter gasket. Contact a local ASE certified mechanic as soon as possible so they can replace the oil cooler adapter gaskets on all of the oil lines to prevent future leaks. If you notice oil stains, drips, or puddles of oil under your vehicle, it is possible that an oil cooler adapter gasket isn’t doing its job of sealing your engine’s lubrication system. A call to the technicians at YourMechanic can bring you peace of mind by having their trained technicians investigate the source of the oil leak. By finding and fixing oil leaks, you can prevent damage to your engine and save yourself a tremendous amount of money.